A few weeks ago I popped along to the House of Fraser in Glasgow to attend the Clarins Skin Spa. 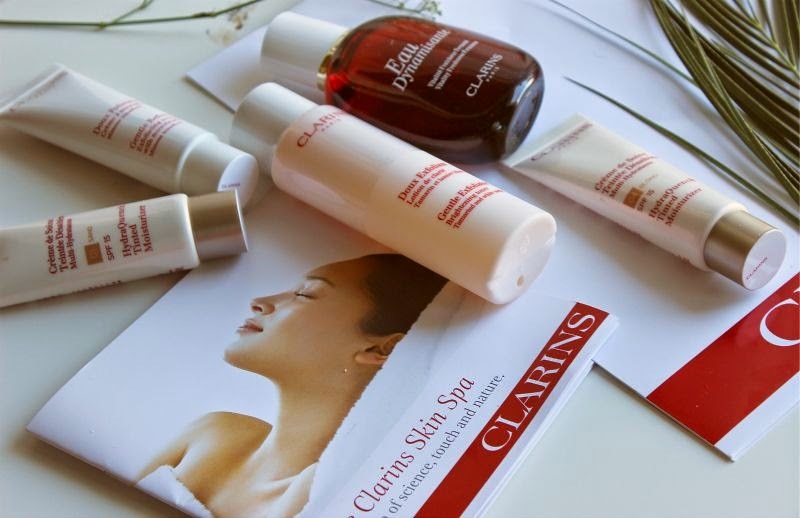 I was lucky enough to have both a consultation and a Clarins Tri-Active Facial with Marie who is Clarins UK Head of Treatment Development so as you can imagine what she doesn't know about skin simply isn't worth knowing. What can I say Marie is fabulous, before my treatment began she had a good feel of my skin and agreed that although overall I am oily I do have a few dehydrated patches which are through negligence on my part - lazy with both moisturiser and drinking 8 glasses of water a day...whoops! I had a few skin care questions which Marie happily answered and then the lights were dimmed and my facial began. Bliss. No two Clarins TriActive Facials will be exactly the same, the idea is that each facial is completely customised to suit each individuals concerns and skin type. My skin is fairly dull and due to the excess oil I do get clogged pores rather easily...lovely I know. Marie created a soft but deep exfoliation routine for me using Clarins products so that I could easily re-create the process at home should I want to and trust me you want to. What I fail to understand is how an hour at the gym drags in and feels like a full day and yet a glorious hour long facial only feels as is ten minutes have passed. Witch craft I tell ye. I'm guessing it is due to the fact you a snuggled up under a huge pillowy duvet and completely at ease, you can't hear the hustle and bustle of the outside world or fellow shoppers. Hard to believe that tucked away in the House of Frasers is a portal to a Spa. A real Spa! After my facial I did have a little break out - two blemishes appeared but hey my skin needed flushed out. One thing you can't beat is that fresh, youthful glow after a facial. The one time when you feel entirely confident going about your business without as much as a lick of mascara. My skin was beyond soft, glowing and after two or three days 100% clear. Thanks to Marie's tips, routine and handiwork my skin has never looked or felt better, it was truly the best facial I have had and I urge everyone to find their local House of Fraser Spa and book in ASAP. You and your skin deserve it. You can find a list of all the Clarins Skin Spa's (worldwide) here - link. - I was lucky enough to receive my first facial for free as a press trip.